Gordon Liu stars as San Te, a passionate young man who is so disgusted with the tyranny of the Manchu Dynasty that he joins the local rebellion, which only gets his family killed by Tien Ta (Lieh Lo), the vicious general whom they were supposed to be assassinating. He promptly joins the Shaolin Temple, except not for spiritual enlightenment, but to learn their martial arts so that he can avenge his family and friends. This creates friction with the other Monks, as they believe in isolating themselves from the outside world, but he persists and begins training in their style of kung fu. He journeys through the 35 Chambers of Shaolin, each one specializing in one aspect of martial arts. I reviewed “The 36th Chamber of Shaolin” in the past, but reading my original writing now, I think my disappointment in this alleged ‘kung fu classic’ overshadowed the entirety of my critique. All I seemingly do is whine about how it wasn’t as great as I was hoping it would be. I decided to watch the movie again AND…my overall opinion remains unchanged, even though this time I want to emphasize that I do like “The 36th Chamber of Shaolin“. I’ve even decided to not contest its shining reputation, as it’s beloved for its stellar production values, creative display of acrobatics and psychological- yet fast paced- choreography…not for it’s script. Kung fu flicks love their training segments, but “The 36th Chamber of Shaolin” is a full length feature training segment. A good hour is dedicated to San Te enduring the Chambers. Now don’t get me wrong, the Chambers are fascinating thanks to the ingenuity of their designs, especially in how they relate to martial arts. But the narrative climaxes when he’s finished with them…and just when we think the end credits are about to start rolling, we remember that there’s an entire revenge subplot that needs resolving. During the 3rd and final act, we’re introduced to new characters and strategies that usually would be the focus of the first half of the 2nd act…It’s bizarre and anti-climactic, because San Te’s final challenge almost seems a little too easy for him, so the tension was minimal. I was also a little taken aback by how he’s never called out on killing people, even though that’s a complete betrayal of the monks philosophies. Nevertheless, it was gratifying seeing San Te show off his his mad skills, especially because Gordon Liu is so good in this kind of role. I liked how he’d have to hide his small smirk whenever someone would doubt him, as it gave his character a touch of humanity…and it’s not like the action of the 3rd act is any weaker than what we got earlier. The fight scenes are a lot of fun, but the choreography plays up the strategic side of a duel, which strengthened the narrative. San Te is always planning ahead and adapting to his enemies styles and it shows every time he participates in a battle. “The 36th Chamber of Shaolin” is definitely one of the more memorable additions of the genre, warts and all. I might not be as passionately in love with the feature as the majority of the fanbase is, but we’re still on friendly terms and I encourage all kung fu fans to check it out! As I was watching “Return to the 36th Chamber” to prepare for this trilogy review, I began to realize that this wasn’t the first time I had seen it. When it was over I decided I would skim through the internet to check out other peoples thoughts and much to my surprise, my own review was one of the first ones advertised…I had already written about this, but had not only completely forgotten that I had seen “Return to the 36th Chamber“, I had somehow even forgotten that I had critiqued it! My rating had been 3.5/4 stars when I covered the film in 2013, but now I feel I have to be a little harsher, as the film was obviously not that memorable…even though I keep saying in my writing that it ‘stands out’ more than its predecessor…even though I could still recall “The 36th Chambers of Shaolin” with a high amount of clarity even before I recently revisited it…Sometimes reviewers are just wrong and stupid, but luckily I do consider “Carnosaur” to be an Orson Wells-ian classic, so hopefully that will rebuild my image in your eyes. 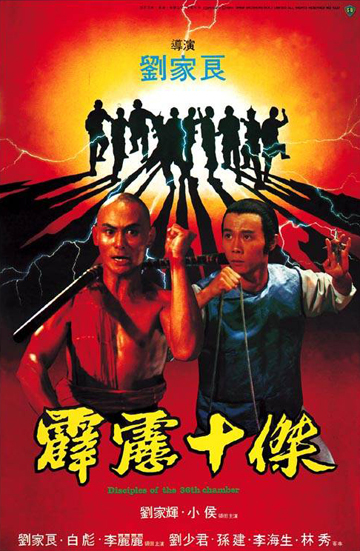 Gordon Liu returns to the titular Chamber, but this time as a different character named Chao Jen-Cheh, a bumbling con-artist who masquerades as San Te- whom you may recognize as his role from the first movie…So yes, Liu is playing a character who is playing his original character who is now played by someone else and that’s pretty amusing. Circumstances lead him to actually visit the Shaolin Temple to try and scam the monks into training him. 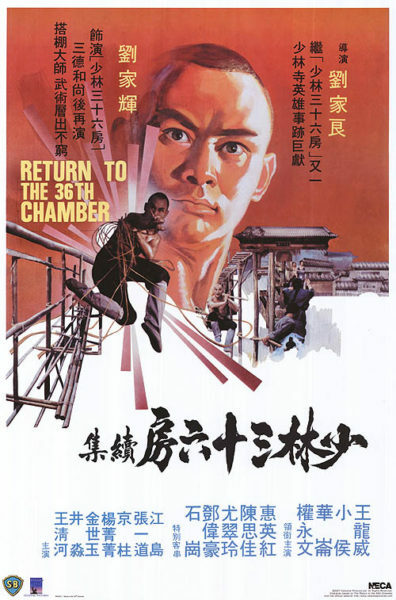 “Return to the 36th Chamber” has lower stakes and a more light hearted tone, even though you really do despise the villains and feel cathartic when our ‘hero’ gets to torment them. I thought the movie was mostly hilarious, the story was creative and the narrative was a lot smoother. Even though most of the screen-time is still dedicated to training, the way it transitions into the third act felt like the plot was reaching its natural conclusion, whereas the first film felt like it was about to end right when the plot was only beginning, even though it was still about to end. Once again, the trials of the 36th Chamber boast an ingenuity you can’t really get anywhere else and the way Chao Jen-Cheh incorporates it into his fighting style leads to some of the most imaginative choreography that I have ever seen. There isn’t as much action this time around, but the finale has the perfect balance of spectacle and martial arts-based storytelling, while showcasing the extent of Gordon Liu’s skills. I actually prefer this over “The 36th Chambers of Shaolin“, but it lacks the novelty of the original and obviously I can’t seem to remember it for very long, so I can’t call it ‘superior’ anymore. To read my full written review, click HERE. 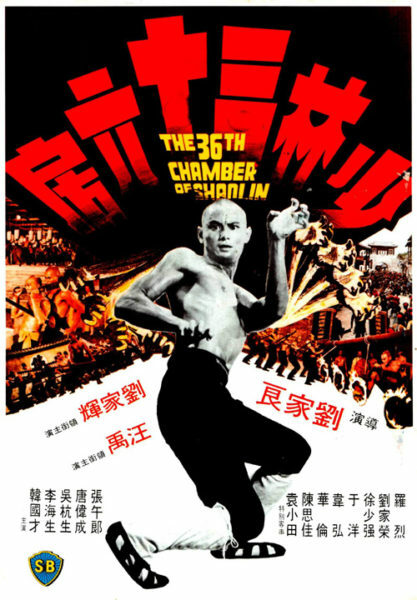 The good news is that “Disciples of the 36th Chamber” is in fact, a kung fu movie…and the choreography is pretty good! It’s good…but not great…and yes, it is very strange that I am criticizing a martial arts flick for merely having good choreography. Its predecessors set the bar too high by having inventive fight scenes, whereas this was mostly standard kung fu action. Nevertheless, let’s sweep away the negativity and focus on why it works. There’s a lot of impressive acrobatics on display, ranging from athleticism to balance to speed and it all looks glorious on the camera. Even though I hated his character, Hou Hsiao showcases an arsenal of slick maneuvers and I like how different his fighting style is from the rest. The editing is bad when it comes to transitions, as sometimes a scene would begin without even letting the audience know that the previous one had ended, but this never became an issue with the action. The martial arts was fast, smooth and plentiful, making “Disciples of the 36th Chamber” enjoyable despite its shortcomings. The finale is a lot of fun, even if the tone was so chaotic that I wasn’t sure if I should be feeling tension because characters die or if I should just be laughing alongside said characters. There are a lot of weapons, fists and feet being thrown around in a relatively confined area though, so this was an ambitious set piece. The director always knows when to push in to focus on specific characters or when to pull out, getting the audience drunk on the spectacle of the entire battle. I did like how the Chambers training has a pay-off and it gives a different dynamic to the action scenes. “Disciples of the 36th Chamber” is certainly worth a view if you liked its predecessors and 3rd act alone might make it worth watching, but expect to be frustrated at points. The movie was fine, but I’m glad it ended here as the franchise rot was already beginning to show. “Heroes of the Wild (1977)” movie review.